I’ve been butting my head against James Joyce’s final novel, Finnegans Wake, for about 40 years. The most multilayered and unstable collection of words ever written, it’s not a summertime beach read. Using about 80 different languages, and an ear fine-tuned to the musicality and mutability of language, Joyce spent 15 years composing it. Many readers, including scholars of Joyce, have called Finnegans Wake “unreadable,” and I would agree. Challenges include making sense of the 10 100-letter “thunderwords,” and appreciating its circularity – the last and the first sentence form a continuous loop. 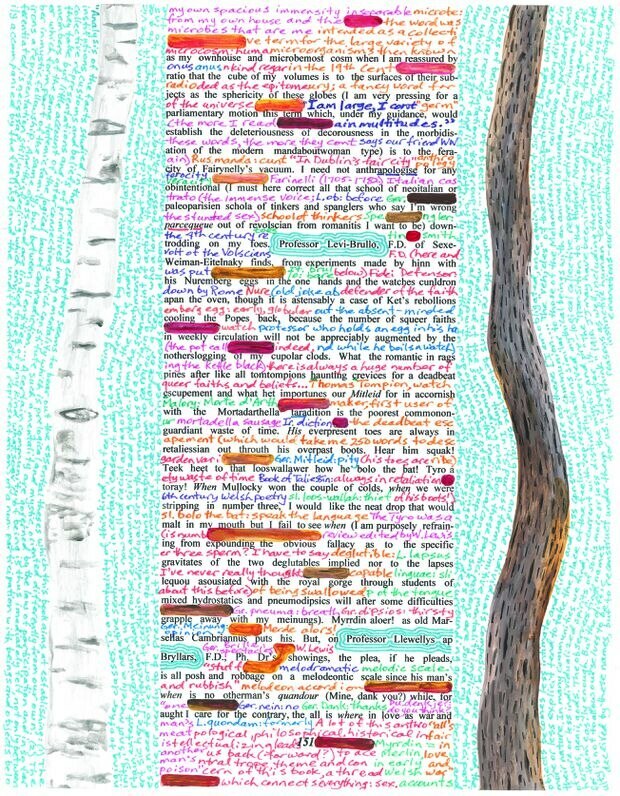 Lots of Fun with Finnegans Wake is my six-year project to navigate, excavate and play with the text. I’m creating one page for each of its 628 pages, using my natural impulses to connect the intellectual with the illustrative, the visual with the verbal. Perhaps my annotations and images will introduce new audiences to this endlessly fascinating text. 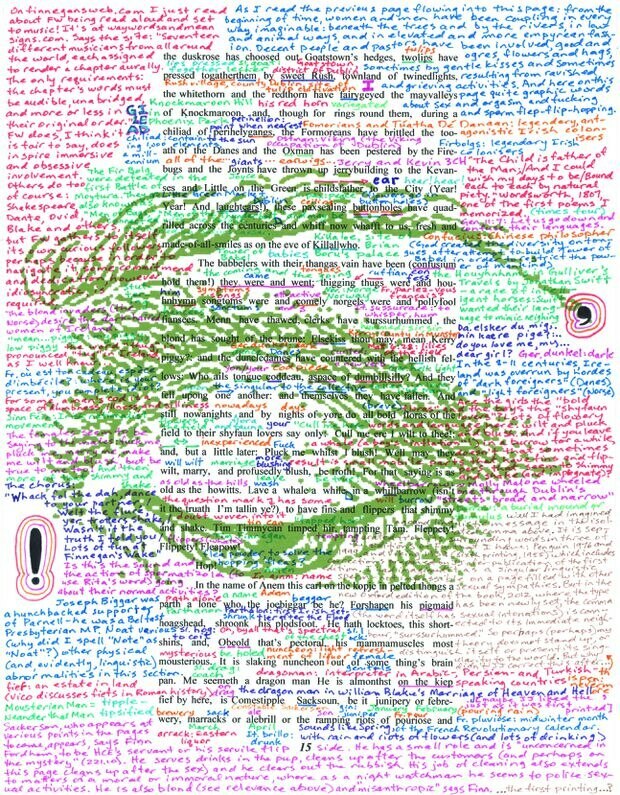 This page is from the beginning of the book, where the eye still has to acclimatize itself to the curious and disruptive ways that Joyce arranges letters on the page. After a while, words such as “togatherthem,” “perihelygangs” and “mousterious” begin to resonate, reveal their secrets and connect with other words in the text. Joyce used grist for Finnegans Wake from wherever he found it: the Bible, drinking songs, the morning paper. I likewise use images from various sources. These two trees are side-by-side at the cottage of a friend, and I thought they would be appropriate on a page where Joyce invokes Lucien Lévy-Bruhl and his work in the growing fields of sociology and ethnology. As I looked at this page, I kept seeing the words “her” and “she,” so I decided to play with them. 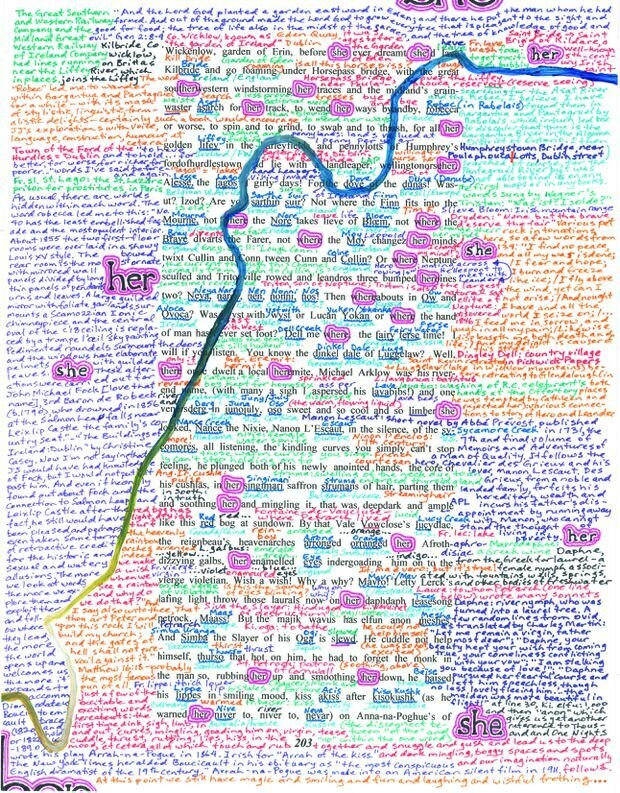 This section of the book references hundreds of rivers, so I’ve underlined each one, and then painted a small section of the Rio Grande here, which flows into, on page 204, the Yellow River. I asked a friend to make two footprints on this page, first at the bottom and then at the top. 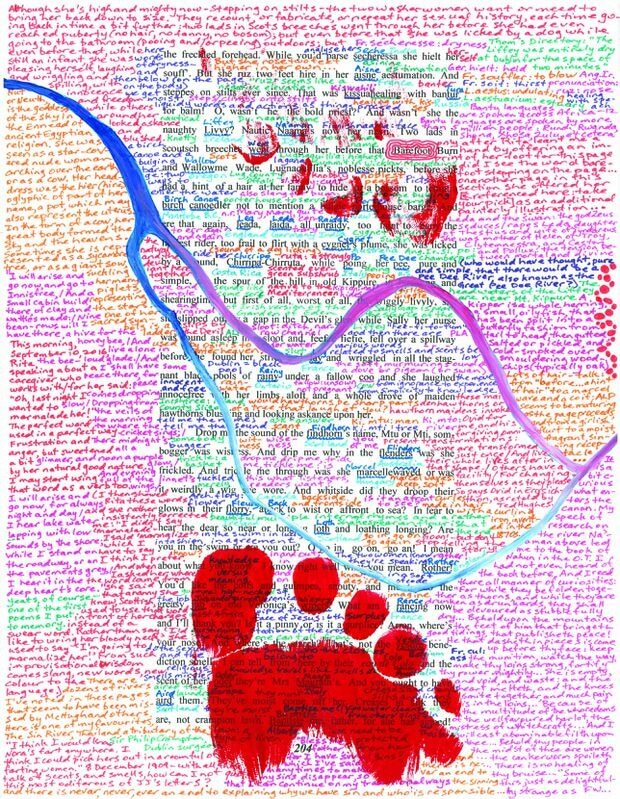 Only later did I see the word “Barefoot” imprinted on the page. In this section of the book we can hear two washerwomen talking to each other from opposite sides of a river, so perhaps that is why the footprints are separated by a watery divide.